Creating a dining room that is both beautiful and functional requires a delicate balance. There are many factors to consider, including general comfort and ease of mobility. As you plan and decorate your dining room in your new SummerHill home, here are some rules of thumb expert designers swear by so you can create the perfect space. Consider your room’s dimensions, the number of people you want to seat, and your entertaining when selecting a dining table. If your space is expansive or narrow, an elongated oval or rectangular table is a good option. In contrast, the more compact square or round tables are best for smaller spaces. Look for tables that are at least 36” wide to provide enough room for guests and serving dishes. Allow at least 12” between the chair seat and the top of the table. The average dining table is 30” high so look for a chair that is at least 18” high. If you choose a chair with armrests, make sure there’s at least 7” of clearance from the bottom of the table. The backs of the chairs should be taller than the top of the table. To create visual interest, consider mixing chair styles and sizes. If you prefer a more traditional or formal look, choosing a different chair type for the “host seats” is a good way to accomplish this. When selecting a lighting fixture, choose one that is properly scaled to the room and table. Center the table on the chandelier or pendant lighting. Leave between 24 to 32” of space between the bottom of the fixture (the lowest point) and the top of the table. Multiple pendant lights or a long, linear light fixture typically work better than a round chandelier. Avoid rugs that have shag or thick piles. These types of rugs tend to catch crumbs and are difficult to clean. Instead, opt for flatweave or tufted and low-pile rugs. Buffets and china cabinets are great double-duty pieces that can provided additional storage space and extend your serving options. If you add furniture, keep in mind the 30 to 36” space standard in mind, as well as keeping the piece off the rug if you have one. 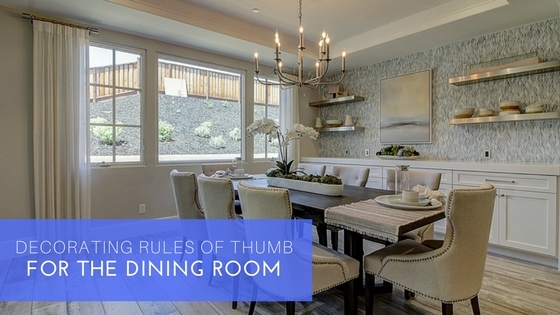 Hope these design rules of thumb help you as you design your dream dining room.